I remember that years and years ago I would always get a big can of popcorn for the holidays because every year, holiday popcorn is sold at almost every grocery store here in the US. Two of my favorites flavors are cheddar and caramel. And this may sound weird, but if you mix the two together, the saltiness from the cheddar mixed with the sweet caramel is absolutely delicious. 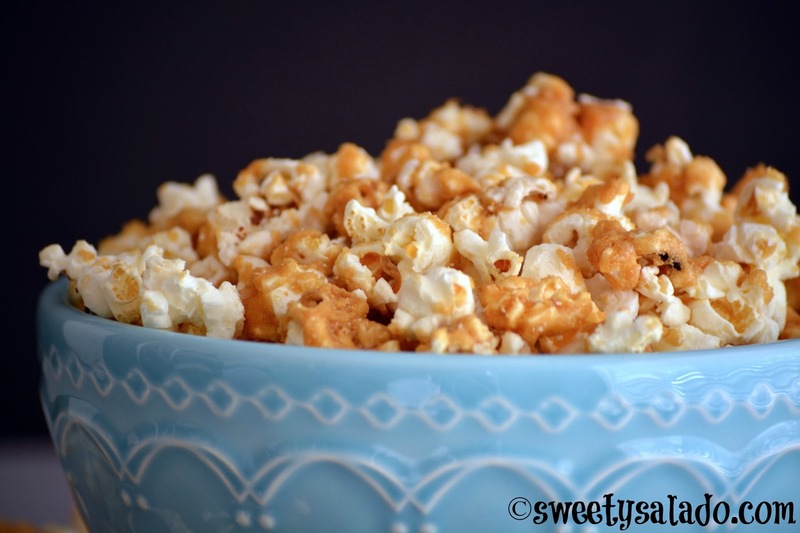 So that’s one of the things I try to make every year once fall arrives, make lots of flavored popcorn, and this caramel recipe is one of my favorites because it’s easy to make and the flavor is phenomenal. I will try to make more popcorn recipes in the future because the combination of flavors is endless and like I said, it couldn’t be easier to make. Pre-heat oven to 250ºF (121ºC). Melt butter in a medium saucepan over medium heat. Stir in brown sugar, corn syrup and salt. Let it come to a boil and simmer for 5 minutes. Then, remove the saucepan from the heat and add the baking soda and vanilla and stir again. 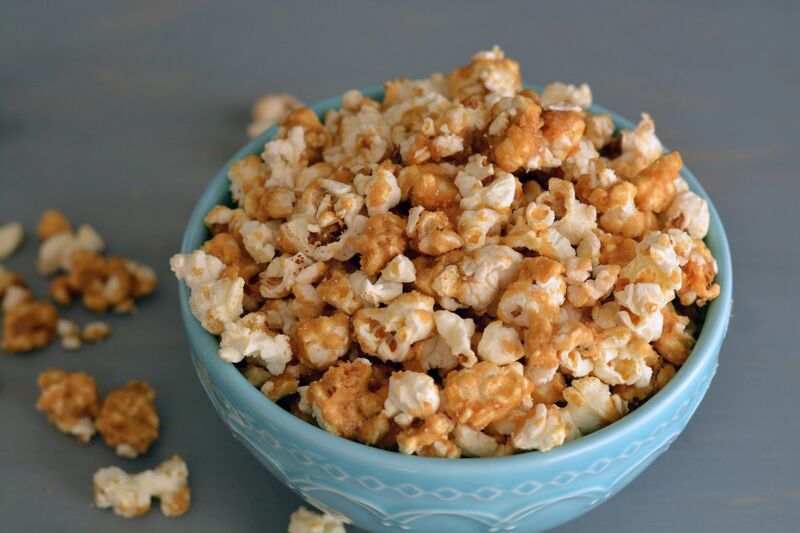 While the caramel is simmering on the stove, pop all three bags of popcorn in the microwave and place it in a very large bowl. You can also use several large bowls to make it easier.4. Pour the caramel over the popcorn and stir it well with a large spatula. Make sure you do it quickly and evenly. 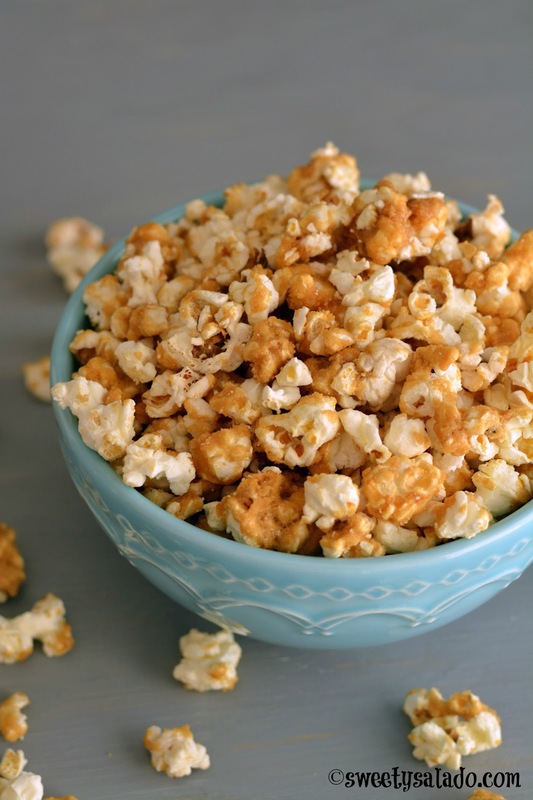 Spray two large baking dishes with oil or rub oil with a paper towel and pour in the caramel covered popcorn. Bake for 1 hour and stir it every 15 minutes to make sure it doesn't stick together. Remove from the oven and let it cool completely. Stir it 3-4 more times while it's cooling to break up any clusters that may form.